In most cases, today’s technology—high-quality computer graphics, extreme data calculations and 3-D imaging and printing—has improved the way society trains and educates professionals. But in the field of biology and medicine, the computer-generated images and models can’t compare with tradition—dissection on a human cadaver. 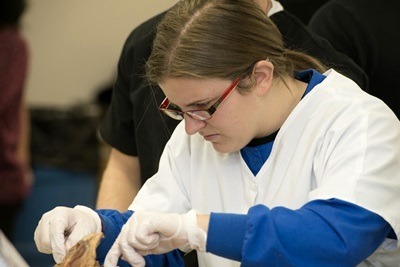 “Many studies have shown that comprehension and retention plummet when students don’t have the hands-on learning experience on a human cadaver,” said Karen Samonds, assistant professor of anatomical sciences. 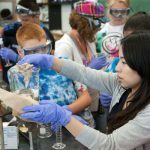 A recent study by Michigan State University, which compared how well students identified parts of the body and explained how they worked using computer images and models and human cadavers, solidified what educators such as Samonds have known all along. On identification, students who learned on a cadaver scored, on average, about 16 percent higher than those who learned on the computer simulation. On explanation, students who learned on a cadaver scored about 11 percent higher. According to researchers, this finding was particularly surprising since one of the benefits of a multimedia program is that it can show how parts of the body work – such as blood flow – while a cadaver cannot. According to the study, the difference of the scores is the equivalent of a letter grade. For students, that can make a difference when applying to graduate schools. 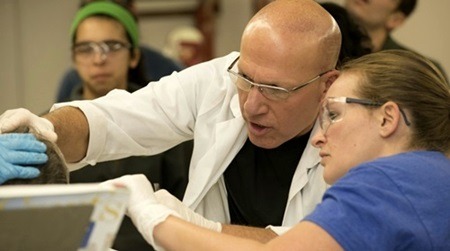 NIU’s anatomy laboratory, located in Anderson Hall, is the setting for three anatomy courses offered by the university. All are taught utilizing donated cadavers. 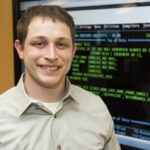 Phillip Persino, a first-year student at Chicago’s Rosalind Franklin University of Medicine and Science, earned a bachelor’s degree in biological sciences and a master’s degree in Human Anatomical Sciences from NIU. He said having a master degree in human anatomy, coupled with his extensive lab experience, made the transition to medical school easier and has helped him in the classroom. “Professors put a great deal of trust in me to find delicate structures and to teach others around me,” he said. The experience fills students with anxiety, only to dissipate when they become immersed in learning about the idiosyncrasies of the human body and its myriad of systems. “Most students say learning on a cadaver was a transformative experience,” Samonds said. Students enrolled in the advanced human anatomy and gross human anatomy courses are expected to work their way through the human body, examining organs as well as systems. “It’s a comprehensive experience,” Samonds said, adding students gain precision, patience, leadership and confidence. The experience builds more than just knowledge and skill. Team dissection of a cadaver provides students with a glimpse of the personal relationships involved in caring for patients. Mary McGinn, a first-year student in the human anatomical sciences program, said the experience of dissecting a cadaver was a solemn occasion. “Before I started my first cut on the cadaver in gross anatomy, I said a brief prayer, thanking the donor for the use of her body and promising her that I would honor her gift by learning as much as I possibly could from it,” she recalled. In addition to learning anatomy, students get a glimpse into a person’s life. Thomas Gorney, a first-year doctoral student in physical therapy, said students form a bond with members of their dissecting team, but also with the cadaver. “We ended up naming ours and developed their whole life story,” he added. 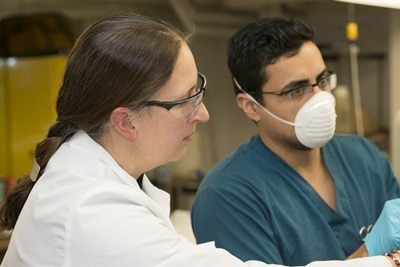 One advantage to learning on a cadaver is the ability to learn in three dimensions, said Daniel Olson, assistant professor of anatomical sciences and director of the anatomy laboratory. Gorney said a cadaver gives students a complete, detailed picture of the human body and how systems work together. The experience of learning about the human body using cadavers isn’t limited to just NIU’s undergraduate and graduate students. Every spring, the lab offers an opportunity for area high school students to learn about human anatomy utilizing NIU’s cadavers. More than 350 high school juniors and seniors enrolled in anatomy and physiology classes will come to NIU this spring for a one-day course in human gross anatomy. Under the guidance of anatomy faculty and NIU students, visiting students rotate through four stations – prosected cadaver study, organs, bones and models – before taking a 50-question exam. “Not only is this valuable outreach, but it helps us recruit students,” Olson said. The lab and the numerous learning opportunities it provides relies heavily on human generosity, according to Olson and Samonds. “We’re unique among Midwest universities that we have a cadaver lab and a donor program,” Olson said. NIU receives an average of 10 donations a year through the donor program, which began in 1989. The estate of the deceased person is responsible for transferring the body to a specific funeral home. The university will cover body preparation, embalming and cremation costs. Bodies are individually cremated and returned to the families after being utilized in the classroom. The magnitude of the gift isn’t lost on students. “They realize early on that these people represent someone’s family, and this is a unique opportunity,” Samonds said. indeed cadavar is the best option. it really helps the student to understand more when it comes to human anatomy. Dr. Olson was one of the best professors I had at NIU! So glad to see good things still coming out of the anatomy department. I was an Exercise Science major and despite anatomy being one of the harder subjects in my coursework, I really loved the lab and benefited from working with the cadavers. It gives you an amazing perspective that you cannot get from pictures or textbooks. Wow, Paula, what a compelling story, great article, educational and insightful. Thanks.